Death, due to its prominent place in human culture, is frequently imagined as a personified force, also known as the Grim Reaper. In some mythologies, the Grim Reaper causes the victim's death by coming to collect that person. In turn, people in some stories try to hold on to life by avoiding Death's visit, or by fending Death off with bribery or tricks. Other beliefs hold that the Spectre of Death is only a psychopomp, serving to sever the last ties between the soul and the body, and to guide the deceased to the afterlife, without having any control over when or how the victim dies. 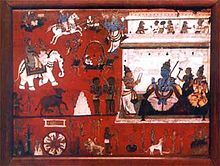 Death is most often personified in male form, although in certain cultures Death is perceived as female (for instance, Marzanna in Slavic mythology, Dhumavati in Hinduism, or La Catrina in Mexico). Mot (lit. "Death") was personified to Canaanites as a god of death. He was considered a son of the king of the gods, El. His contest with the storm god Baʿal forms part of the myth cycle discovered in the 1920s in the ruins of Ugarit. Lacunae obscure some of the details, but Mot apparently consumes Baʿal before being split open and mutilated by that god's sister, the warrior 'Anat. After a time, both gods are restored and resume battle before the sun goddess Shapash prompts a truce by warning Mot that, if forced to, El would intervene on Baʿal's behalf. The Phoenicians also worshipped death under the name Mot and a version of Mot later became Maweth, the devil or angel of death in Judaism. In Ancient Greek religion and Greek mythology, death (Thanatos) is one of the children of Nyx (night). Like her, he is seldom portrayed directly. He sometimes appears in art as a bearded and winged man, less often as a winged and beardless youth. He has a twin, Hypnos, the god of sleep. Together, Thanatos and Hypnos generally represent a gentle death. 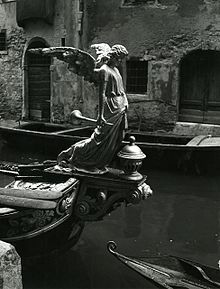 Thanatos, led by Hermes psychopompos, takes the shade of the deceased to the near shore of the river Styx, whence the boatman Charon, on payment of a small fee, conveys the shade to Hades, the realm of the dead. Homer's Iliad 16.681, and the Euphronios Krater's depiction of the same episode, have Apollo instruct the removal of the heroic, semi-divine Sarpedon's body from the battlefield by Hypnos and Thanatos, and conveyed thence to his homeland for proper funeral rites. Among the other children of Nyx are Thanatos' sisters, the Keres, blood-drinking, vengeant spirits of violent or untimely death, portrayed as fanged and taloned, with bloody garments. 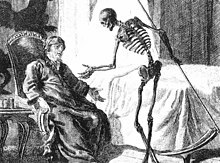 Breton folklore shows a spectral figure portending death, the Ankou (yr Angau in Welsh). Usually, the Ankou is the spirit of the last person that died within the community and appears as a tall, haggard figure with a wide hat and long white hair or a skeleton with a revolving head who sees everyone, everywhere. The Ankou drives a deathly wagon or cart with a creaking axle. The cart or wagon is piled high with corpses and a stop at a cabin means instant death for those inside. In the Netherlands, but also to lesser extent in Belgium, the personification of Death is known as Magere Hein ("Meager Hein") or Pietje de Dood ("Peter the Death"). Historically, he was sometimes simply referred to as Hein or variations thereof such as Heintje, Heintjeman and Oom Hendrik ("Uncle Hendrik"). Related archaic terms are Beenderman ("Bone-man"), Scherminkel (very meager person, "skeleton") and Maaijeman ("mow-man", a reference to his scythe). The concept of Magere Hein was pre-Christian and tied to Pagan beliefs, but it was Christianized and likely gained its modern name and features (scythe, skeleton, black robe etc.) during the Middle Ages. The designation "Meager" comes from its portrayal as a skeleton, which was largely influenced by the Christian "Dance of Death" (Dutch: dodendans) theme that was prominent in Europe during the late Middle Ages. "Hein" was a Middle Dutch name originating as a short form of Heinric (see Henry (given name)). Its use was possibly related to the comparable German concept of "Freund Hein". Notable is that many of the names given to Death can also refer to the Devil, showing how his status as a feared and "evil" being led to him being merged into the concept of Satan. In Belgium, this personification of Death is now commonly called Pietje de Dood "Little Pete, the Death". As with some of the Dutch names, it can also refer to the Devil. 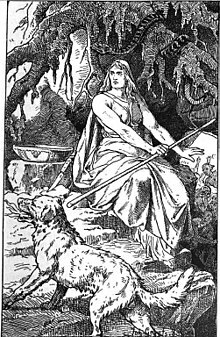 In Scandinavia, in Norse mythology death was personified in the shape of Hel, the goddess of death and ruler over the realm of the same name, where she received a portion of the dead. 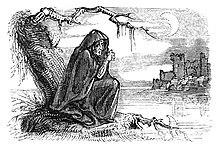 In the times of the Black Plague, Death would often be depicted as an old woman known by the name of Pesta, meaning "plague hag". She wore a black hood. She would go into a town carrying either a rake or a broom. If she brought the rake, some people would survive the plague; if she brought the broom, however, everyone would die. Later, Scandinavians adopted the classic Grim Reaper with a scythe and black robe. Today, Ingmar Bergman's film The Seventh Seal features one of the world's most famous representations of this personification of Death. In Korean mythology, the equivalent of the Grim Reaper is the "Netherworld Emissary" Jeoseung-saja (저승사자). He is depicted as a stern and ruthless bureaucrat in Yŏmna's service. A psychopomp, he escorts all—good or evil—from the land of the living to the netherworld when the time comes. Jewish tradition also refers to Death as the Angel of Dark and Light, a name which stems from Talmudic lore. There is also a reference to "Abaddon" (The Destroyer), an angel who is known as the "Angel of the Abyss". In Talmudic lore, he is characterized as archangel Michael. In Hebrew scriptures, Death ("Maweth/Mavet(h)") is sometimes personified as a devil or angel of death (e.g., Habakkuk 2:5; Job 18:13). In both the Book of Hosea and the Book of Jeremiah, Maweth/Mot is mentioned as a deity to whom Yahweh can turn over Judah as punishment for worshiping other gods. The memitim are a type of angel from biblical lore associated with the mediation over the lives of the dying. The name is derived from the Hebrew word mĕmītǐm (מְמִיתִים – "executioners", "slayers", "destroyers") and refers to angels that brought about the destruction of those whom the guardian angels no longer protected. While there may be some debate among religious scholars regarding the exact nature of the memitim, it is generally accepted that, as described in the Book of Job 33:22, they are killers of some sort. According to the Midrash, the Angel of Death was created by God on the first day. His dwelling is in heaven, whence he reaches earth in eight flights, whereas Pestilence reaches it in one. He has twelve wings. "Over all people have I surrendered thee the power," said God to the Angel of Death, "only not over this one [i.e. Moses] which has received freedom from death through the Law." It is said of the Angel of Death that he is full of eyes. In the hour of death, he stands at the head of the departing one with a drawn sword, to which clings a drop of gall. As soon as the dying man sees Death, he is seized with a convulsion and opens his mouth, whereupon Death throws the drop into it. This drop causes his death; he turns putrid, and his face becomes yellow. The expression "the taste of death" originated in the idea that death was caused by a drop of gall. By acts of benevolence, the anger of the Angel of Death is overcome; when one fails to perform such acts the Angel of Death will make his appearance (Derek Ereẓ Zuṭa, viii.). The Angel of Death receives his orders from God (Ber. 62b). As soon as he has received permission to destroy, however, he makes no distinction between good and bad (B. Ḳ. 60a). In the city of Luz, the Angel of Death has no power, and, when the aged inhabitants are ready to die, they go outside the city (Soṭah 46b; compare Sanh. 97a). A legend to the same effect existed in Ireland in the Middle Ages (Jew. Quart. Rev. vi. 336). Islamic tradition discusses elaborately as to what exactly happens before, during, and after the death. The angel of death appears to the dying to take out their souls. The sinners' souls are extracted in a most painful way while the righteous are treated easily. After the burial, two angels – Munkar and Nakir – come to question the dead in order to test their faith. The righteous believers answer correctly and live in peace and comfort while the sinners and disbelievers fail and punishments ensue. The time period or stage between death and resurrection is called barzakh (the interregnum). Death is a significant event in Islamic life and theology. It is seen not as the termination of life, rather the continuation of life in another form. In Islamic belief, God has made this worldly life as a test and a preparation ground for the afterlife; and with death, this worldly life comes to an end. Thus, every person has only one chance to prepare themselves for the life to come where God will resurrect and judge every individual and will entitle them to rewards or punishment, based on their good or bad deeds. And death is seen as the gateway to and beginning of the afterlife. In Islamic belief, death is predetermined by God, and the exact time of a person's death is known only to God. Death by Cholera personified as a Reaper in Le Petit Journal. ^ a b Cassuto, U. (1962). "Baal and Mot in the Ugaritic Texts". Israel Exploration Journal. 12 (2): 81–83. JSTOR 27924890. ^ See, e.g., Hab. 2:5 & Job 18:13. ^ "Het Vlaams woordenboek » Pietje de Dood". www.vlaamswoordenboek.be. Retrieved 2019-01-21. ^ a b Niermeyer, Antonie (1840). Verhandeling over het booze wezen in het bijgeloof onzer natie: eene bijdrage tot de kennis onzer voorvaderlijke mythologie [Treatise on the evil being in the superstition of our nation: a contribution to the knowledge of our ancestral mythology] (in Dutch). Rotterdam: A. Wijnands. pp. 32–33. Retrieved 23 May 2016 – via Ghent University. ^ "'Pietje de Dood' jaagt mensen de stuipen op het lijf in de VS". Retrieved 26 January 2018. ^ "Nederlandse Volksverhalenbank - Duivel". www.verhalenbank.nl. Retrieved 26 January 2018. ^ "Hel (Norse deity) – Encyclopædia Britannica". Global.britannica.com. Retrieved 2013-12-08. ^ "død – folketro – Store norske leksikon". Snl.no. Archived from the original on 12 December 2013. Retrieved 8 December 2013. ^ "The Korean National Encyclopedia of Ethnic Practices (Page in Korean)". 210.204.213.131. Retrieved 2013-11-16. ^ Bunson, Matthew, (1996). Angels A to Z : Who's Who of the Heavenly Host. Three Rivers Press. ISBN 0-517-88537-9. ^ Handy, Lowell (1995). The Appearance of the Pantheon in Judah in The Triumph of Elohim. Grand Rapids, Michigan, USA: Eerdmans. p. 40. ISBN 0-8028-4161-9. ^ Olyan, S.M., A Thousand Thousands Served Him: Exegesis and the Naming of Angels in Ancient Judaism, page 21. ^ Gordon, M.B., Medicine among the Ancient Hebrews, page 472. ^ "Bible Gateway passage: Revelation 6:7-8 - New American Standard Bible". Bible Gateway. Retrieved 26 January 2018. ^ a b c Matt Stefon, ed. (2010). Islamic Beliefs and Practices. New York: Britannica Educational Publishing. pp. 83–85. ISBN 978-1-61530-060-0. ^ Nigosian, S. A. (2004). Islam: Its History, Teaching, and Practices. pp. 123–4. ISBN 0-253-21627-3. ^ a b Oliver Leaman, ed. (2006). The Qur'an: An Encyclopedia. Routledge. p. 27. ISBN 978-0-415-32639-1. ^ Juan E. Campo, ed. (2009). Encyclopedia of Islam. Facts on File. p. 185. ISBN 978-0-8160-5454-1. Gordon, Maurice Bear (December 1941). "Medicine among the Ancient Hebrews". Isis. 33 (4): 454–485. doi:10.1086/358601. JSTOR 330623. Hamburger, J[acob] (1884). "Tod". Real-Encyclopädie für Bibel und Talmud: Wörterbuch zum handgebrauch für Bibelfreunde, Theologen, Juristen, Gemeinde- und Schulvorsteher, Lehrer &c (in German). 1. Strelitz, Mecklenburg: Selbstverlag des Verfassers. pp. 990–992. OCLC 234124918. Retrieved 3 March 2013. This article incorporates text from a publication now in the public domain: Kaufmann Kohler and Ludwig Blau (1901–1906). "Angel of Death". In Singer, Isidore; et al. The Jewish Encyclopedia. New York: Funk & Wagnalls. Wikimedia Commons has media related to personification of Death.